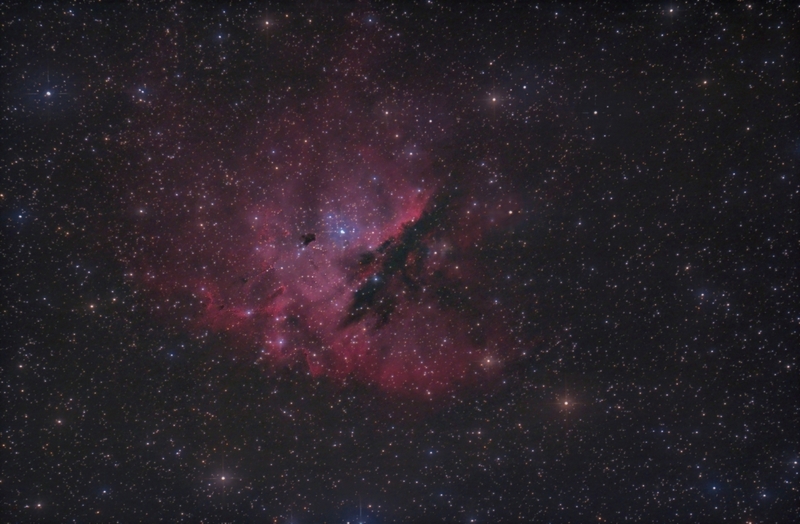 The Pacman Nebula, NGC 281, in Cassiopia is an emission nebula in the Perseus Spiral arm. It includes the open cluster IC1590, several bok globules and a central dark rift that gives the nebula its characteristic shape similar to the 1980's video game character. Processing This image was processed entirely in Images Plus. Calibration, stacking, statistical filter applied to reduce noise before stretching. Masked stretching and split star processing used to enhance the image. Masked noise reduction using a frequency domain lowpass filter applied to the DSO layer and then it was recombined with the star layer. Image binned 2 by 2. Final sharpening applied. Since the 60Da has on sensor dark suppression, no darks were used in the calibration.